Interested in Becoming a Member of the Paducah Police Department? The Paducah Police Department is one of the finest law enforcement agencies in the country. Such recognition requires the agency to have employees of high integrity, values, and professionalism. As you will see in this video, our people are what make us great. Paducah Police Department Recruitment Film - "The Basic Value of Love"
A high school diploma or GED and an employer verification letter indicating four consecutive years of full time (40 hours or more a week) work experience with the same employer (“Four consecutive years employment” must be within five years of date of application). If you have a question, click Recruiting Team to contact a member of the Paducah Police Department's team. After submitting the application and once it is determined that you meet the minimum qualifications, you'll be placed on the list for the next testing session. The testing process involves a physical agility test and a written test, administered consecutively on the same day. Those who receive a passing score on these exams will be scheduled as soon as possible for an interview. Based upon your tests and interview results, as well as the number of vacancies in the Department, an investigation regarding your background is initiated. Former employers, co-workers, friends, and neighbors will be asked about your character and integrity. There will also be checks of your criminal history, traffic record, and credit report. 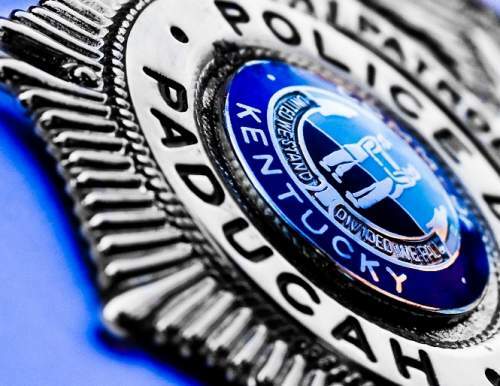 Hopefully, after a comprehensive review of your application file, you will now be among those eligible finalists to be selected as Paducah Police Officer Recruits. Law enforcement is a challenging and rewarding career. However, not everyone has the required integrity, communication skills, and commitment to serve their community. It takes an individual who can work under adverse and stressful conditions, possesses sound decision-making skills, and can work effectively and efficiently in a team concept. If you think you have the desired skills and abilities to begin a successful career with the Paducah Police Department, please review the following minimum qualifications. Must possess a minimum of 60 credit hours from an accredited college, community college, or vocational school; OR a high school diploma or GED and proof of one year of sworn, full-time law enforcement experience; OR a high school diploma or GED and proof of two years of full-time military service; OR a high school diploma or GED and an employer verification letter indicating four consecutive years of full time (40 hours or more a week) work experience with the same employer (“Four consecutive years employment” must be within five years of date of application). Must have standard visual acuity: Corrected vision should be at least 20/30 for both eyes together. Uncorrected vision for those who wear glasses should not be worse than 20/100 for both eyes together. Candidates who wear soft contact lenses, should have uncorrected vision not worse than 20/200 in both eyes together. Police Officer applicants may be disqualified during the selection process when it is determined that the applicant is not qualified or suitable for the job. Visit Reasons for Disqualification for a list of criteria that serve as guidelines to assist in determining disqualification. The Paducah Police Department boasts a competitive salary and benefits package in a part of the country known to have a low cost of living. After one year of service, the salary with benefits and a bachelor’s degree is $61,422 (July 2019). Certified officers, from other police agencies, are eligible to receive up to five (5) years of service credit resulting in a starting salary/benefit package of up to $65,686 (July 2019). In addition, the state of Kentucky provides "incentive pay" after graduation from the Academy. Officers also receive 10 paid holidays and 15 days vacation the first year, vacation increases with years of service. Firearms and all leather gear are furnished, and uniforms are purchased using an annual clothing allowance. After completion of the Police Training Officer (PTO) program, McCracken County residents are eligible for a take-home police vehicle. Health insurance, educational tuition assistance, access to exercise equipment, and a wellness program are just a few of the perks of being a Paducah Police Officer. Additionally, Specialized Assignments are available following the successful completion of a probationary period. In 2012, the Paducah Police Department created a committee which included members of the Paducah Human Rights Commission to assess current law enforcement practices and the community's feeling toward how the Paducah Police Department can better appeal to potential minority candidates. The committee hosted a Minority Recruitment Community Forum June 14, 2012 at the Robert Cherry Civic Center. The forum was a question and answer session to gain input from the community in how to increase the number of qualified minority applicants. Community feedback is vital in developing a solution. A youth forum was held later in 2013 in cooperation with the Oscar Cross Boys & Girls Club with approximately 30 in attendance. What has been gleaned from the two sessions is that police need to be more involved with youth at an earlier age and actively look for ways to be positive role models. Some of the programs that have been enacted due to feedback to the committee include the Junior Citizens' Police Academy, an open house for high school and college students, and the restarting of the Law Enforcement Explorer program. For more information regarding employment, send an email to Paducah Police Recruiting or call 270-444-8534. For application information, email Martin Russell at the City of Paducah Human Resources Department or call 270-444-8540. For information about becoming a Paducah Police Officer, call 270-444-8534 ext 2207. Members of ethnic minority groups and females are strongly encouraged to apply. Below are members of the Paducah Police Department's recruiting team.